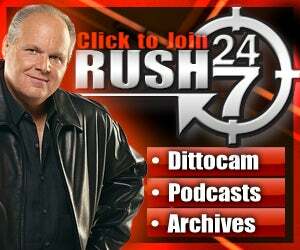 RUSH: Well, here we are again, ladies and gentlemen: The unemployment rate has gone down. And I have finally figured it out. While you might think I’m saying this to be funny — ’cause I’m a naturally funny person, I know this, one of the most naturally funny people you’ve run into. I’m not trying to be funny here. Barack Obama has decided that the only way to lower the unemployment rate is to kill off jobs. The unemployment rate went down one-tenth of a percent from 8.2% to 8.1%, but the number of people who left the labor force is at an all-time high. But our poor buddies over at Fox this morning fell for it. They fell for the unemployment rate going down from 8.2% to 8.1%. “Oh, yay! Hey, we’re moving in the right direction.” We’re not moving in the right direction. It is sick, folks — it’s just unacceptable — what is happening to this country and what’s happening to the jobs and the entire private sector. I’ll get to the details here in just a second. It looks like — and I don’t want to assume too much here. But it looks like we may have finally shamed some of the Drive-By Media, like Reuters, into presenting a slightly more accurate report on these jobs numbers. A few months ago… The headline here: “April Hiring Slows, Jobless Rate Falls to 8.1%.” I maintain to you that a few short months ago, if all the news was that the rate went from 8.2% to 8.1%, the headline would not be “April Hiring Slows.” It would be “Obama Policies Finally Taking Hold,” or something like that. “Job Creation Final Turning Around! Is Economy Next?” Something like that. But because of the constant pressure, the constant mockery, the constant humiliation of these people in the Drive-By Media I don’t think that they can do it. Well, like I said: I don’t want to take too much credit. I’ve gotta rein this in. I just know that in recent months past we would not have had an accurate headline, nor would we have had an accurate story as we mostly do from Reuters today. Like a couple of months ago this headline would probably have said: “Jobless Rate Falls to 8.1%, Lowest in Three Years.” Instead, Reuters admits that hiring has decreased for the second straight month. In fact, only a measly 115,000 jobs were added last month. Do you realize that to begin job creation at a replacement level, we would have to be in the neighborhood of 500,000 jobs a month and getting close to 600,000 to 700,000 a month to gain ground? This is pathetic: 115,000 jobs. And when you demographic this, when you get to the younger demographics, it’s worse. It’s nowhere near 8.1%. We’re looking 15% to 20%, among the young idealists who expected (well, whatever they expected) their utopia, back in 2008, when voting for Obama. People are leaving the workforce and that’s why the rate’s going down! Jobs are not being created. And that’s the Obama magic. All Obama is about is that 8.1%. He doesn’t care about the number of jobs created. Obama and the Democrats know they can’t jump-start the economy. Look at what we’ve tried here. How many trillions have been spent on “stimulus” that has not worked? Even if they still believed in that, they know that there’s not stimulus out there. There’s nothing they can do to create private sector job growth. So all they can do to get that number down — and like AP said yesterday, they predicted they’re gonna have it below 8% by Election Day. The only way they can do that is force people out of the job market, and that is exactly what is happening. But only in the Orwellian world of government statics could the fact that more people gave up looking for work, make the unemployment rate go down. That claim would embarrass a Soviet. If an adviser to Lenin or Stalin came in and said, “Comrade, we want to kick people out of the job market, give them no hope of getting a job. “That’s how we’ll lower the unemployment rate!” That person would have been sent to a gulag somewhere next to Solzhenitsyn. But instead of 115,000 jobs being added each month, we ought to be seeing job numbers in the 500,000 to 600,000 level, if there were a real economic recovery going on. Just a little more than two years ago, April 23rd, 2010, the vice president, Joe Biden, predicted that the American economy would be adding up to half a million jobs every month. Now, neither Reuters nor the rest of the media will report the U-6 unemployment number. See, this 8.1% is the U-3 number. That does not count the people who’ve left the job market. That does not count people who have stopped looking. The U-6 number from the Bureau of Labor Statistics — which is not reported — which does count the people who have stopped looking, was unchanged at 14.5%. The U-3, the reported unemployment number of 8.1%, breaks down this way: Men, 7.5% unemployed. Women, 7.4% unemployed. Teenagers, 24.9% unemployment. Whites, 7.4%. Blacks, 13.0%. Hispanics, 10.3%. Asians, 5.2%. There’s no category reported for “white Hispanics” or “one-thirty-second Cherokee Indian females.” But the highest rate: Unemployment is 13.0% for African-Americans. Okay, that’s the Reuters story. So, I think we can now say — and, again, this is gonna sound to you like I’m trying to be funny and sarcastic. I’m not. This is really sad stuff. I think we can safely say that Obama’s election strategy for getting the unemployment rate down is to kill jobs. As I have said for the longest time now: Pushing people out of the workforce drives down the unemployment rate. When that happens, Obama claims the “recovery” is slow but steady. So, as you see, the unemployment rate fall, what you must understand is the need to do a 180 on your thinking. You must understand it means the job situation is worsening. Under Obama, when the unemployment rate falls, the jobs situation is getting worse. The more people who drop out of the workforce, the more those people rely on government subsidies. And, by the way, there’s a relatively new phenomena going on. That is people applying for disability under Social Security. People whose unemployment benefits have expired are now seeking assistance via SSDI, Social Security Disability Insurance. That number is skyrocketing. Food stamps are at a record high. Social Security disability is at a record high. So the transformation from a capitalist market system to authoritarian centralized welfare state continues, while Obama claims an improving job market. But there is no recovery. And it’s clear, again: The election strategy for getting the unemployment rate down is to kill jobs. Now, normally when I find useful charts and graphs, I don’t use ’em. (I mean, it’s a radio show.) But I have that Dittocam there, and I have a couple of charts here. I have the Labor Force Participation Rate Chart (which, when you see this, it’s a help) and the Persons Not in the Labor Force Chart. That number is now over 88 million. What’s the adult population? We have 311 million people total, but the adult population? 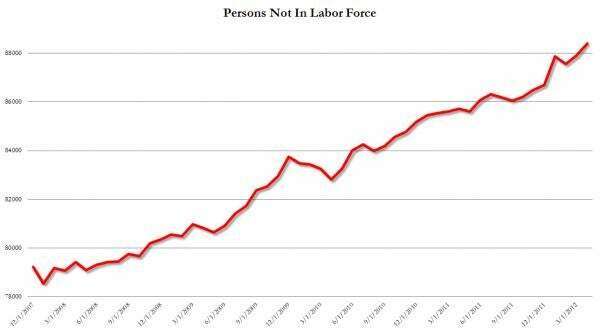 I don’t know what it is, but 88 million people not in the labor force! Some of the other numbers here (and this is from CNBC): “Though the headline number indicated job creation,” 8.2% to 8.1%, to some — and you really can’t blame ’em, folks. I mean, people that don’t listen to this program or read much outside what they see on television are not gonna know any of what you know and what you were just told. So, the headline number: “Oh, looky, it’s 8.2% to 8.1%!” It’s a natural thing to conclude that the job market’s improving. You can’t blame anybody for thinking that. They don’t know the truth. But CNBC reported: “Though the headline number indicated job creation, the total employment level for the month actually fell 169,000.” Total employment, meaning more people lost jobs than got them, and yet the unemployment rate went down. The only way that can happen is for people to be leaving the job force, the labor force, the job market. And as CNBC says: “The disparity likely emanates from a drop in the labor force participation rate — or the level of Americans actively looking for jobs or otherwise employed … ‘In the weakest recovery since the Great Depression, more than four-fifths of the reduction in unemployment has been accomplished by a dropping [or falling] adult labor force participation rate,” said University of Maryland economist Peter Morici. She’s the cradle-to-crave, typical Obama voter, a woman from age three to age 67. Everybody has taken their turn at turning that around and making it funny and so forth. But the fact of the matter is, that’s the dream citizen as far as the Obama administration is concerned. That’s the dream citizen: Constant care, cradle-to-grave, taken care of, everything in life provided by the government. Everything, except a husband. This woman had a child but there was no mention of a man in her life at any point. Not even buried in the garden! There was no mention of a husband, no mention of a boyfriend, no mention of a sperm bank. No mention of a gay fashion designer. I mean, no mention of a man anywhere in that slideshow. So this economist has it right: “essentially persuading adults they don’t need a job.” That is what Obama has done! Oh, he’s out there talking it up real good, and he talks about what theoretically happens in the private sector. You go to the school, you work, you get paid, and you start a business. You take some risks. He doesn’t believe any of that. What he’s actually done is promised to pay the freight for people who don’t want to work anymore. The only way 88 million Americans can be out of the job market is either for there to be a depression or for the government (or somebody) to be taking care of them so that they don’t have to work. And I maintain to you it’s by design and on purpose. RUSH: I do have a little bit more data here on the unemployment information, and I want to stick with it because it’s a passion of mine that you know the truth, particularly when everybody’s being bombarded with the lies that the administration wants to settle in. Here is what Obama will not be telling college kids as he runs around and warns them of the pitfalls awaiting them if Mitt Romney’s elected. The unemployment rate among jobseekers between the ages of 16 and 19 was 25% in April, up from 23% in February. Youth unemployment has been above 23% for 34 months. The Obama administration promised us that with the passage of the stimulus bill in 2009, the unemployment rate would never reach 8%. It has been above 8% for a period of time so long that it can accurately and truthfully be said that the unemployment rate has not been this high for this long since the Great Depression. Not one promise, not one theory, not one assurance has come close to being true as told us by this administration. The unemployment rate has not been this high for this long since the Great Depression. This is life in Obama’s America. It’s reality. This is not a cartoon; this is not a slideshow; this is not a socialist utopian slideshow with a woman named Julia. And they shoulda named her Ludmilla or Svetlana or Maureena, not Julia. This is why Obama creates fictional stories about fictional people. Reality is the enemy to the Obama administration. Well, that’s the good question. I don’t know. You have 88 million Americans not in the job force, but they’re eating. Eighty-eight million Americans not in the job force are using their cell phones. Eighty-eight million people not working are driving their cars. There is no pain to not having a job. That’s not true for every one of them, but it’s true for a number of ’em, and we don’t know how many. There are some people for whom unemployment (or if you run out of that, turn on your Social Security disability payments) pays more than some of the jobs that are being created in this administration. Unemployment compensation plus food stamps adds up to more than two-thirds of the jobs and the kind of jobs being created. See, during the Great Depression, when whatever the numbers were who were unemployed, they weren’t comfortable. There was a sense of urgency. They would dig ditches if they had to. They will pick cotton if they had to. But now, it isn’t necessary. And, by the way, we don’t have the money to support people not working! We are $16 trillion in debt. We are borrowing it from the ChiComs, enabling them to ramp up their military complex. This is a horrible, horrible situation. You want some more numbers? I have numbers. Just like Bill Burkett had numbers tying George Bush to the National Guard, I have numbers. Since President Obama took office, the unemployment rate has increased from 7.8% to 8.1%. And as we know, it’s been in the nines. There are currently a million unemployed workers that have given up looking for work since the last report. Given up looking for work! Therefore they’re not in the labor force. Therefore they’re not counted. There are currently 7.8 million workers working part-time for economic reasons. Only 115,000 jobs were added. The labor force participation rate is 63.6%, a 30-year low. We are at a 30-year low in the number of Americans working. With 8.1% unemployment, Obama has extended his record of 8%-plus unemployment now to 39 consecutive months. It has not been this high, this long, since the Great Depression. If the labor force participation rate had stayed the same as in March, the unemployment rate would have risen to 8.4%. In other words, if they hadn’t just said that a million people left the job market, the unemployment rate would be 8.4%. It woulda gone up. This is precisely why I’m saying to you that to get the rate down, Obama is killing jobs. Our buddy Jim Pethokoukis points out: “If the size of the US labor force as a share of the total population was the same as it was when Barack Obama took office … the U-3 unemployment rate would be 11.0%,” not 8.1%. And if the unemployment rate were 11% today, what do you think the prospects of Obama’s reelection would be? They would be over. I repeat this again: The unemployment rate would be 11% today if the labor force was the same size as when Obama took office. Now, you’re asking, “Well, how can they just eliminate the jobs?” Well, for one thing, they have eliminated ’em. (chuckles) Have you gone and tried to find one lately? Number two, they run the Bureau of Labor Statistics, the Department of Labor. If they want to say a million people left the job market last month, they can say it. And they’re probably right! They’re probably right. Because if 88 million people are not working but they’re still eating and driving and using their cell phones and able to watch the E! Entertainment Network after Entertainment Tonight while they’re TiVoing Two and a Half Men — all to watch Obama later that night slow-jam the news with Jimmy Fallon — what does it matter whether they have a job or not? The unemployment rate, if the US labor force was the same size today as when Obama took office, would be 11%, folks, instead of 8.1%. In April of 1984, coming out of similar Jimmy Carter-type economics and circumstances, Ronaldus Magnus was approaching the end of his first term. In April of 1984, the US economy added a population-adjusted 480,000 jobs. That was at the beginning of the Reagan boom. That was the beginning of the boom with Reaganomics, which Obama and the Democrats tell us didn’t work! They told us it never worked. It’s as simple as this: The number of people in the job market is based on something called the Household Survey at the Bureau of Labor Statistics. And do you know what they do there? They call people and ask, “Have you looked for to a job in the last four weeks?” And whatever the answer is gets tabulated. That’s how scientific it is. That’s where we are. And, finally: “US worker productivity fell from January through March by the most in a year.” I thought we had a “moderate recovery” happening here, and I thought we had “turned a corner.” I thought we’d been around the bend and back. I thought we were back from up against the wall! So not only are fewer people working; their output fell by the most in a year. “While worker output rose, the number of hours worked increased by an even larger amount.” Therefore the overall output was down. You see how they’re monkeying these numbers?